Men and women, old and young have all been part of the recent surge of asylum seekers into the European Union, Norway and Switzerland. But a lesser-known story about this surge is the rapid rise in child migrants traveling without an adult guardian. Since 2008, about 198,500 unaccompanied minors have entered Europe seeking asylum, according to data from Eurostat, the EU’s statistical agency. The first significant jump came in 2014, when the number of unaccompanied minors seeking asylum almost doubled compared with 2013, from 13,800 to 23,200. A year later, in 2015, the total quadrupled to a record 96,000. The 2015 total alone accounts for nearly half (48%) of unaccompanied minors that have entered Europe since 2008. Nearly 7% of all first-time asylum applications in 2015 were from unaccompanied minors, the highest share since data on accompanied minors became available in 2008. In both the U.S. and Europe, the great majority of unaccompanied minors are teenage boys. In 2015, about three-fourths of unaccompanied minors seeking asylum in Europe were males ages 14 to 17. In the U.S., about three-fourths of unaccompanied minors apprehended at U.S. borders were also teenage boys of the same age in fiscal 2015. Since 2008, about four-in-ten of Europe’s unaccompanied minors – 76,700, or 39% – have traveled from Afghanistan, about a 3,000-mile trip. That makes Afghanistan by far the single largest source country of unaccompanied minors in Europe since data became available. 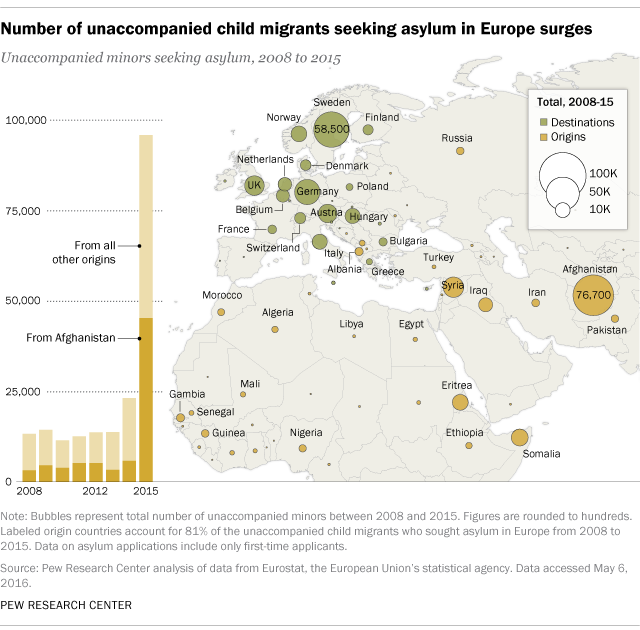 Unaccompanied minors also come from other far-flung places. Some 13,200 arrived from Somalia and another 11,600 have arrived from Eritrea since 2008. Travel from both countries requires navigating treacherous terrain and a perilous journey across the Mediterranean Sea. Other top countries of origin include places closer to Europe, including Syria (19,300 arrived since 2008) and Iraq (9,100), while some source countries are in continental Europe, including Albania (3,100) and Russia (2,700). Unaccompanied minors do not always apply for asylum in the first European country they enter. Many travel north through the continent. Between 2008 and 2015, almost a third (58,500) of all unaccompanied minors seeking asylum in the European Union, Norway or Switzerland have sought asylum in Sweden. Another 29,600 have applied for asylum in Germany (15%) and 17,800 (9%) have applied in the United Kingdom. But the eight-year totals mask a change in destination countries among unaccompanied child migrants applying for asylum in Europe. In 2015, Sweden received more than a third (37%) of European unaccompanied minors, up from 11% in 2008. By contrast, the United Kingdom declined dramatically as a destination for unaccompanied child migrants. In 2008, 32% of unaccompanied minors sought asylum in the UK, a share that dropped to just 3% in 2015. The British House of Commons is debating whether to accept more child migrants. Other European nations are also grappling with child migrant policies, as thousands of asylum seekers wait on Europe’s borders to enter. Statistics on the success rates for asylum applications of unaccompanied minors are unavailable. But recent success rates for all asylum seekers to Europe are highest for Syrians, Eritreans and Iraqis. By contrast, success rates are considerably lower for asylum seekers from European countries such as Albania and Russia.